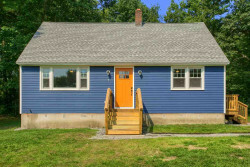 Here is your opportunity to move into this completely renovated open concept cape. NEW roof, NEW boiler, NEW septic system, and so much more. The home features an open and bright living room with a great sitting room and a fantastic picture window. The kitchen boasts new white cabinets that are topped with granite counters, all new stainless steel appliances and an open concept dining room. There are three bedrooms upstairs and a full bathroom. Need more space? The lower level is ready to be finished doubling your square footage. Step outside and enjoy the private and level acre lot on a private cul-de-sac. Recently renovated throughout! This 4 Bedroom Colonial offers a spacious open concept living space on main level, NEW Kitchen with center island for additional seating and storage, NEW Stainless appliances, Dining area with slider to backyard all open to large living room with hardwood floors. Main level also offers 3 Bedrooms with hardwood floors and NEW Main Bath with Granite counter and Tiled surround for the tub area. In the lower level you will find a front to back oversized family room with wood fireplace, 4th Bedroom with walk-in closet and 1/2 bath with Laundry. Outside you'll find spacious patio between Home & 2 car detached garage. Terraced front, side & backyard have been recently seeded.